Just 12 kilometres north of the Mpumalanga town of Middelburg is an historical gem which appears to be little known to many South Africans. It is now the subject of a land claim, a claim by people whose forefathers were given succour by missionaries in the nineteenth century and who are now demanding the very land to which their ancestors fled and which fostered them in their time of need. Enormous tensions have built up in Middelburg between those who are afraid for the future of Botshabelo, and the claimants, some of whom have publicly declared they will turn the South African Heritage Site into a pig farm. The claimants plan to house hundreds of families on the site. The controversy is raging outside South Africa’s borders, as far afield as Germany. The Botshabelo affair is an egregious example of how the South African government’s land reform policy is out of control, and where the practical has been suffocated by the ideological. Bothshabelo was established by German missionaries Alexander Merensky and Heinrich Grutzner in 1865. These two men were sent to South Africa by the Berlin Missionary Society, and arrived in Natal in 1858. There they made contact with the Zulus and the Swazis, and then began working among the Pedis with the permission of their king. Their first mission station was built in Gerlachtshoop, in the area controlled by the Pedi chief Maleo. With permission of the tribal chief Sekwati, more missions were built. Sekwati died in 1861 and his son Sekhukhune inherited the Pedi crown. Two of his wives converted to Christianity and were baptized. This step caused much dissension within the tribe. One stormy night the Merenskys were woken at the mission Gerlachtshoop in Sekhukhuneland by a distraught convert from Sekukhune’s kraal. He warned that hundreds of the chief’s impis were on their way to the mission. At that very moment Merensky’s wife went into labour, giving birth to a daughter within earshot of the chanting and howling warriors. Merensky sent a message for help to neighbour Hermanus Steyn who farmed on the other side of the Steelpoort river, the border between Sekhukhuneland and the old Boer Republic of the Transvaal, the Zuid-Afrikaansche Republiek (ZAR). Steyn sent a wagon packed with roof thatching. It stopped near the mission station and Merensky’s wife and child hid under the thatching grass and were taken across the rising river to safety, together with the black converts from the mission. The water rose so quickly after Mrs. Merensky’s crossing that the impis could not cross. 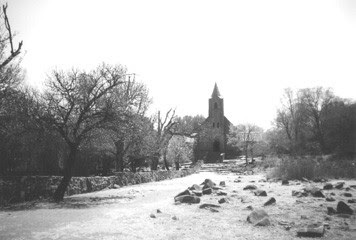 The old German missionary church at Botshabelo - a proposed heritage site. 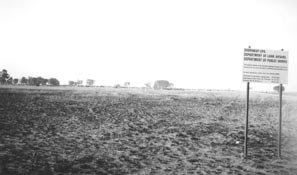 On 21 January, 1865 Merensky and Grutzner bought the farm Boshoek (in the district of Middelburg) from Jan Abraham Joubert. 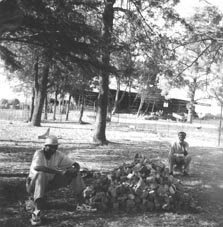 On 8 February Merensky, his family and 113 refugees from Sekhukhune moved onto the farm which they called Toevlugsoord. It later became known as Botshabelo (“place of refuge”). Johannes Dikwanjane, Sekhukhune’s brother, was one of the leaders of the tribal refugees at the mission. He assisted with the building of a fort (Fort Wilhelm, named after the German Kaiser) at the mission station because of the continual fear of a Sekhukhune attack. Other small forts and rampart walls were built to ensure the safety of the mission station. A rondavel and a church were constructed and all these buildings can still be seen today at Botshabelo. A shop, a mill with a permanent miller, a book binding operation and a press, a wagon-making shop and a blacksmith’s shed were created by a missionary with vision and talent. The refugees had suffered at the hands of Chief Sekhukhune. He had plundered their cattle and crops. When they arrived at the mission in February it was already too late in the season to plant. With detailed planning and their faith in God, according to historians, the mission and its refugees survived. Thus did Botshabelo become a home to those who had fled their chief and his tyranny. Merensky trained and schooled them. Under the mission’s tutelage, these refugees learnt to make wagons, they became cabinet makers, and they learnt to make bricks and to build. A school was built and the refugees were taught to read and write and were instructed in Gospel teachings. The descendants of these refugees are now claiming Botshabelo. They say because they were born there, they have an historical right to the mission station, its land and its improvements. Undeterred by the fact that their forefathers survived because of the charity and concern of the German missionaries, these claimants are adamant the land is historically theirs. They have claimed the land under Section 11A (2) of the Restitution of Land Rights Act, 1994, as amended. Their claim form states that they were forcibly removed in January 1972 to the Motetema area and that their “houses were demolished and we were paid no compensation and received no land”. This is not true. Lengthy negotiations between the then government’s representatives and the claimants took place, they were paid compensation and they received alternative living quarters. The reason for their removal was because, at the time, mission stations were the collectors of homeless people who became in actual fact voluntary squatters. Whether one agrees with the then government’s policy of removal or not, the point remains that the claimants were not the owners of the land upon which they squatted, nor did they have any historical/tribal claim to the land. They were at the mission station at the grace and favour of the missionaries. In a document dated 8 September 2003, the Commission on Restitution of Land Rights, Mpumalanga (CRLR) says that the claimants are the direct descendants of the original “buyers of the farm”. But those who sought refuge at the mission station, and their children, never bought the farm. The CRLR also says that the community was dispossessed of the “beneficial rights to land, which include occupational rights”. In law, occupying land at that time did not give people legal title to the land. The early mission’s reputation spread far and wide. More and more people came to be converted, many it was felt because it was a safe place to stay and find work. In 1868 a bigger church building was commenced. It was added to and in 1871, the larger building was consecrated. By 1873, there were 1315 people living at Botshabelo. The mission station was at one time bigger than Middelburg, which was founded in 1864. After Merensky’s return to Germany in 1882, he was replaced by others from the Berlin Missionary Society. Botshabelo became known as a witness to Christian teaching. It became a place for the propagation of Christian faith! Many residents of Middelburg, taxpayers whose forefathers contributed to the upkeep and growth of Botshabelo, ask why this historical site (which attracts over 2 000 visitors per week) should now be handed over to a group of people whose forefathers happened to be born on the land because of the compassion of the missionaries. . It is not traditional tribal land. It never was in the hands of the claimants’ forefathers. They did not develop Botshabelo. They lived from it. For many Christians, Botshabelo represents something of a holy place, a place which was a refuge for Christians escaping certain death at the hands of Sekhukhune’s impis. Even the name implies this – Botshabelo means “a place of refuge”. In 1972, the city council of Middelburg purchased Botshabelo and it has become a world-renowned tourist attraction. It was in the process of being declared a National Heritage Site, but the land claim stopped this process in its tracks. The land claim was contested by Dr. Klaus Merensky, great grandson of Alexander Merensky. His parents and the children of Alexander Merensky were buried in Botshabelo’s graveyard. He asked the Middelburg municipality, the owners of Botshabelo, to remove the graves at their cost. The land claim should never have even been considered by the government, said Dr. Merensky. It never belonged to any tribal leader. His letter to the head of the Land Claims Commission (LCC), Adv. Wallace Mgoqi, was ignored. In a letter dated 8 September 2003 inviting people to celebrate the handover of what the LCC calls the Groenfontein Ramohlakane land claim, the Commission on the Restitution of Land Rights outlines what it calls “the history of dispossession”. (Groenfontein is one of the seven farms surrounding Botshabelo). The Commission declares the claimants were forcibly removed from their land in 1959 in terms of the Land Act of 1936, and that the farm Groenfontein is one of the farms that Alexander Merensky of the Berlin Missionary Society purchased in January 1871. A party for the claimants and their friends was held (at taxpayer’s expense) on 17 September 2003 to celebrate the handover of the 600 ha Groenfontein farm, bought by the Department of Land Affairs for the sum of R1 750 000 (again, with taxpayers’ money!). The statistical information provided on the invitation says the beneficiaries will be 3 200 people or 400 households. This is an average of 1,25 ha per family. What will happen to the farm Groenfontein? Let us examine what happened to another farm which formed part of the same Botshabelo claim. Our researchers visited the farm Leeupoortjie, in extent 428 ha which, according to the Government Gazette Notice 2233 of 1998, belonged to F.J. and J.D. van der Bank. At the time of handover around two years ago, the farm ran 400 head of beef and dairy cattle, a dairy and some mixed farming. The improvements were in excellent condition. “We came to the farm in the afternoon”, said the researchers. “Three black men sat on tree stumps, smoking. We asked for the boss, and they said he’s not here. But we live and work here, they advised. What do you do, we asked. Where are all the cattle? The farm property was in disarray. There was no sign of any cattle farming whatsoever. The buildings were decrepit, and the dairy was broken and rusted, while manure more than two years old still lay on the floor. The cattle pens were broken, and the lighting had been vandalized. A few diseased cows and sheep walked past. The animals were thin. We were told by a friend who accompanied us the cattle had not been dipped and looked like they had TB. The throats of the sheep were full of worms. We felt desperately sorry for these animals as they struggled along. Nothing was happening on that farm, paid for with taxpayer’s money. The “owner” was nowhere to be seen, while the three workers were clearly just living there and looking after their own poor cattle. There was no sign of a crop or ploughing. 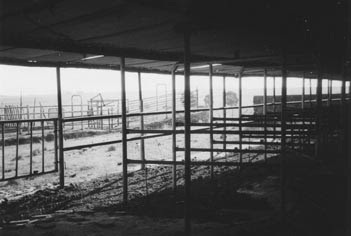 The broken dairy pens at a non-functional dairy – the farm Leeupoortjie, Botshabelo, after the handover. We moved along to the next farm. We cannot mention the name because the owner is being terrorized off his property. His farm has been claimed as part of the Botshabelo claim. A member of his family had been killed two weeks before we telephoned him. He was afraid to talk to us, and understandably so. This is today’s rural South Africa. The farmer has not received a penny for his farm, but he cannot live on it because of the terror and intimidation. It has a dairy on it worth R1 million, and possesses an underground reservoir containing more fresh water than the Loskop Dam. It is clear he will have to accept what the government decides to give him, if they give him anything at all. After all, why should they? He’ll probably leave the property anyway, as have farmers in other parts of South Africa who have been driven off their land. His farm is next to a huge squatter camp of the same name, which developed on a piece of government property. There had been very little water there, and the original 400 000 squatters were moved off this property. They were given better land, and some were paid out. The water on the property was just enough for washing, and for this reason the pre-1994 government used the land as a training camp for certain government departments. In 1996, the government training camp was closed down, and the original squatters returned. According to a source, this move was initiated by the Department of Land Affairs. Nobody knows why the squatters came back, but they have disrupted the whole neighboring farming community, including the farmer next door. His family was intimidated to such a degree that he moved them off his farm into town. . The squatter camp was like all squatter camps in South Africa, a desolate, filthy place. Dead animals lay around, their corpses decomposing in the sun. We saw some water tanks in the distance. Clearly the government is bringing in water to an area upon which people should never have squatted in the first place. Our local companion said bringing the squatters back – despite the fact they were paid out – was a political decision. Was it to frighten the surrounding farmers into selling, especially the farmer with the huge reservoir? It is not beyond the realms of possibility, seeing as this type of rural terrorism exists all over South Africa. We were told that local warlords at the squatter camp were selling plots to Mozambicans, but this could not be confirmed. What of the other farms handed over as part of the Botshabelo claim? Our researchers were told one farm went to the mother of the Mpumalanga Minister of Safety and Security, another to the chairperson of the local tourism board, while a third was taken by Mr. Richard Mphele of COSATU. This property is purported to be Broodboomkrans, a farm of 780 ha which belonged to a Mr. Koos Stals who managed a successful beef operation. The farm is now occupied by squatters. Broodboomkrans was a forced sale, and the new occupants obtained a court interdict to prevent Mr. Stals from visiting his farm. The Middelburg Observer reported on 31 October 2003 that the Mpumalanga MEC for Safety and Security Thabang Makwetla confirmed that he was part of the “successful claim” on Botshabelo. The report also stated that the number of claimants and their dependants had risen to 1,200. Local resident Arthur Barlow, chairman of the Mpumalanga Heritage Foundation, the curator of Fort Merensky (a declared historical monument), has repeatedly requested the ID numbers and addresses of the claimants from the chairman of the Land Claims Commission in Nelspruit, to no avail. The Middelburg Observer has also tried to obtain the details, with no reply. All the claimants say they are descendants of those born on the farm, but no I/D numbers or other personal details are supplied. (For his trouble, Barlow was severely beaten up outside his door one night, and told to “keep your nose out of Botshabelo’s business”). The claimants were assisted by the Johannesburg-based Legal Resources Center who are in turn financed by the Ford Foundation of America. The complete history of the apportioning and sub-dividing of the original mission statement is set out, but nowhere does it state that Botshabelo and its satellite farms belonged historically to the claimants. The Botshabelo site was never tribal land. One portion which was purchased by a Mr. Jeremiah Makuse and eight other blacks on 7 November 1925 is declared in the Legal Resources Center report No. 9 of 1995 “to have never been part of the Mission Station area as it was now held in private ownership”. It was sold to the state. All the other portions were either sold to the state, to the Middelburg municipality or to private persons or companies. The new owners of Leeupoortjie, a handover under the Botshabelo claim. The mission farm is nearly 3000 ha in size. An airfield valued at R14 million lies within the property – the longest airstrip in Mpumalanga. The council now pays R800 a month to lease this airport. There is a well-developed tourist apparatus on the farm, with overnight accommodation, a caravan park and restaurants. The cycad lanatis is endemic to the area – it only exists in that part of the world. It has been registered in the International Flora and Fauna catalogue but already most of these ancient trees have been uprooted and sold. There are walking trails and over R1,5 million worth of game on the farm. More than 176 species of birds have been identified, as well as a large variety of prehistoric cycads. The farm itself is a living museum, with artifacts over 150 years old. Antique furniture, books and other objects were a priceless addition to the complex, but already articles of value and furniture have been stolen. This precipitated the removal of most of the valuables which were returned to their owners. These artifacts were naturally an integral part of the historical value of the site, and have now been lost to the visiting public. In May 2003, SAHRA wrote to the COSATU claimant Mr. Richard Mphele, secretary of the Botshabelo Communal Property Association (CPA). They advised that a conservation policy document had been prepared for Botshabelo, and that the CPA’s written consent was needed to declare Botshabelo a Heritage Site. SAHRA also expressed its concern about the “forced entry and vandalism of the museum collection in the Merensky House”. To date, according to sources, this written consent has not been forwarded to SAHRA. The reason is simple, say sources: if the CPA signs it before they move in, then they cannot move in! Occupying a heritage site means obeying the rules and restrictions imposed because your property is a heritage site. As transfer to the CPA has not yet taken place, it looks as if SAHRA’s request for consent will not elicit the desired results. The Botshabelo claim. The barren land of Doornkop, and in the distance, the squatter camp – previously farmland. The Middelburg council has turned its back on maintaining Botshabelo, says Barlow. There has been no budget allocation for two years, and some of the game is diseased and is now inter-breeding. Furthermore, at a September 2003 Middelburg council meeting, it was resolved that the airfield would be leased to the council for R800 a year for ten years; that council could enter into a privatization agreement regarding the airfield; and that the “compensation received in respect of Botshabelo not be re-invested in the development of Botshabelo due to legislative prohibitions”. It was also confirmed that the Industrial Development Program (IDP) would support Botshabelo for a period of five years in the first amount of R1 million, decreasing to R200,000, and that 40% of the game (valued at R1,5 million) be sold immediately, and that the CPA be permitted to sell “excess” game as determined by the Council in the future. It was also resolved that the houses at Botshabelo be ceded to the CPA from date of registration of transfer. (There are purportedly 700 families ready to move into Botshabelo after transfer of title, but nobody knows the exact number of people planning to occupy the site). Where will they live? Many Middelburgers fear for the future of Botshabelo. There is a story that someone is running around with a cheque for R14 million to build a casino near the airport. Nobody has seen a business plan for the running of the property and tourist sites, and there seem to be no government restrictions or guidelines in force about conserving the place as a heritage site. A legal appeal to prevent the handover of Botshabelo is being considered. However, already the farms which were part of the claim have fallen into disarray. As a result, those who value Botshabelo and who paid for the site are justifiably worried at what will happen to this important piece of South African history and heritage. Middelburg municipality is now under the control of the ANC, and although this municipality bought Botshabelo in 1972, the new council (the present owners) did not oppose the land claim. A local newspaper lamented the passivity and couldn’t care less attitude of the town council vis a vis the future of Botshabelo. A Middelburg Observer report in February 2002 confirmed that the chairman of the CPA Ms. Miza Ranthla wants to farm with pigs, while the Middelburg Council mayor Clr. Mathlakeng Mahlangu said Botshabelo could be turned into a place like the Lost City (at Sun City). Ms. Ranthla also declared that when the land is in their possession, they will “look for donations” to ensure that their pig, crop and flower farming will flourish. The Council is expected to continue financially supporting Botshabelo.